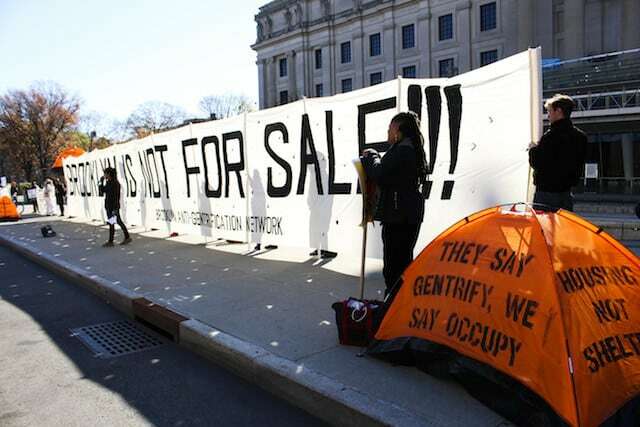 A scene from the Brooklyn anti-gentrification protest at the Brooklyn Real Estate Summit in November. The new podcast will consider whether the borough’s gentrification is at a tipping point. Photo by Maria Travis. Nobody likes to admit they’re a gentrifier, but Kai Wright was definitely ahead of the recent wave of Bed-Stuy gentrification. The Indiana native moved to the neighborhood from Fort Greene in 2004, long before places like Dough, Black Swan or Do or Dine turned the majority black neighborhood into a welcoming spot for white families pushing strollers. He jokes he could see the “red line moving” over the years as wealthier people began to buy up property in the increasingly chic neighborhood, many of whom were priced out of other neighborhoods by even wealthier gentrifiers. But explaining it is something he wanted to do, especially now when many think the borough is on the tipping point of gentrification that many worry could turn Brooklyn’s patchwork multi-culturalism into a playground for the rich living in glass-walled luxury condos. So Wright, the features editor at The Nation, worked with WNYC to create a new podcast There Goes the Neighborhood that debuts tomorrow, to probe the deep forces that are remaking Brooklyn. 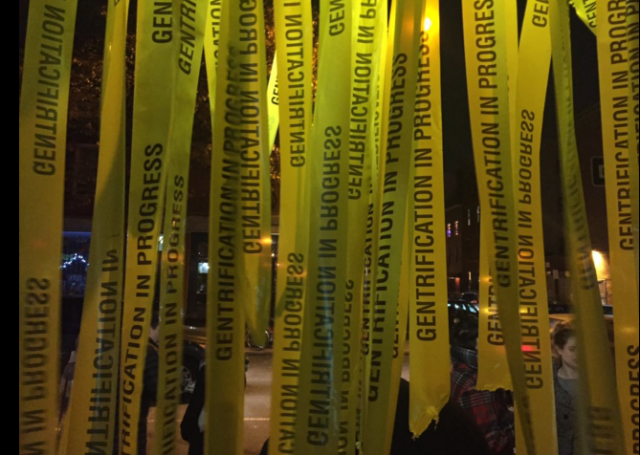 It’s going to paint gentrification as much more than a black and white issue. Gentrification in progress tape at the closing night of NIta Nita in Williamsburg. Photo by Tim Donnelly. 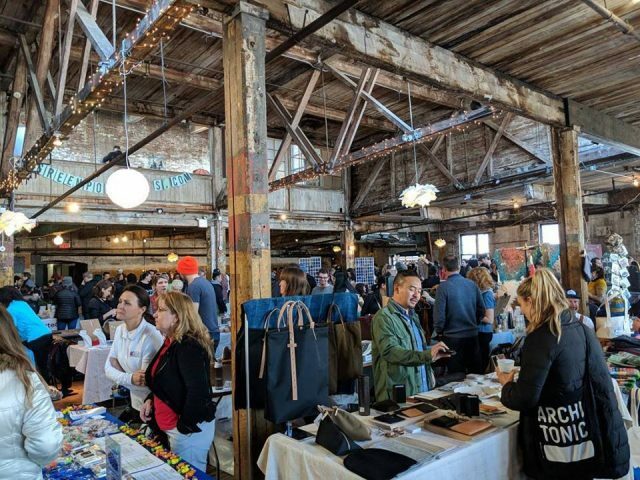 There Goes the Neighborhood will be an eight-part weekly series that will involve long-time residents, developers and newcomers. Part of the point of it is to clear up the misconceptions about what is actually driving the change of the borough. It’s not as simple as pointing a finger at a flood of young white college graduates suddenly appearing, Wright said. 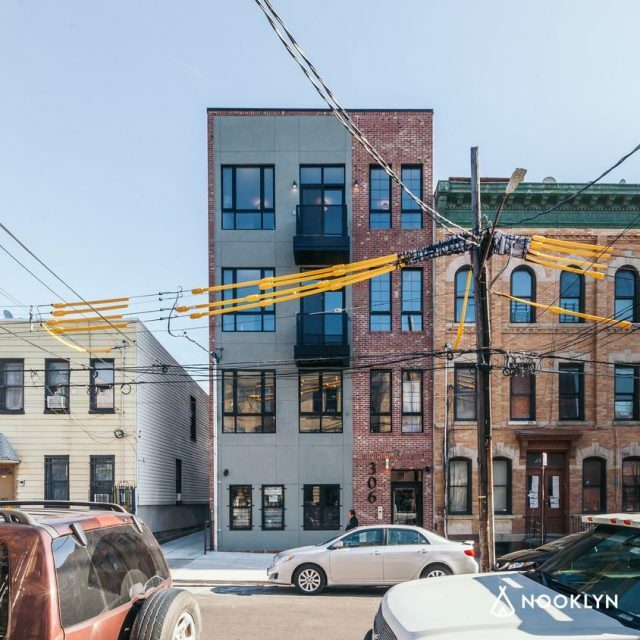 The timing for the podcast is crucial: Just this week, Mayor Bill de Blasio is starting to pitch his ambitious, controversial huge rezoning plan for East New York, with the goal of bringing more below-market-rate housing to the area. It’s the trial run for 15 total rezoning plans the mayor wants to tackle as part of his hallmark affordable housing plan, but he has a tough fight ahead. Imani Henry and another activist invite drivers to “HONK if rent is too high. Photo by Nevin Rao. The show is still being produced, so we’ll have to wait to see if any grand conclusions or solutions can be reached after eight episodes. Producer Rebecca Carroll, 46, worries the borough has already jumped the rent shark, so to speak. Carroll has also seen it first hand. 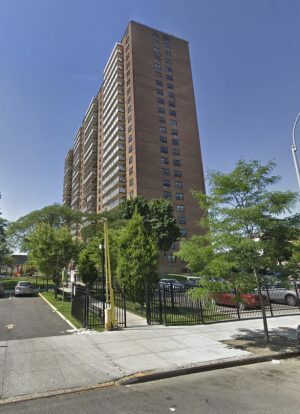 She’s lived on the south side of Williamsburg for 10 years, but when we spoke last week she had just received a hand-written note at her apartment informing her that she, her husband and her middle-school-aged son will have to move soon. While she’s lived there, she’s watched the forces of change turn the northside of the neighborhood from hipster Disneyland to trendy shopping district to mini Manhattan, complete with luxury condos and an incoming Whole Foods. Beyond the news peg of the East New York project, the timing is good for the podcast, Carroll said, because “white privilege has been outed” in national discourse. I asked Wright a question I’ve long mulled over when considering the gentrification of New York City and the blandification of the city it often brings: Where are the landlords who have a sense of civic pride? We crow and complain whenever we hear about landlords who replace neighborhood institutions with dead-eyed banks, end the lease on beloved venues or leave storefronts vacant for years until a high-rent-paying chain comes along. We shake our heads until they’re dangling loose by a tendon whenever we see long time residents harassed out of their apartments. 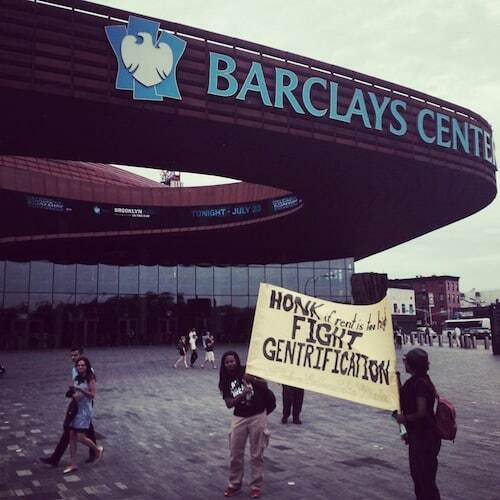 Don’t any of them value the cultural vitality of NYC over profit? Wright says the podcast will tackle this too: Some of the developers they talk to are life-long Brooklynites, but there are bigger forces at work, largely a result of the fallout of the housing market crash of 2008. So at this point, you should be wondering: What the hell am I supposed to do about all this? Maybe you moved from somewhere else to Brooklyn for work, school or fancy mayonnaise and you don’t want to be part of the Problem, or maybe you grew up in Dtimas Park but moved to Crown Heights because it was the only place you could afford to buy any more. The answer, Wright said, is to immerse yourself in the community instead of trying to overwrite it. “If you recognize that there was a community there before you show up and adapt yourself to it, you’ll be in a better place than if you show up trying to extract things,” he said. In other words, know your neighbors, be part of your community, go to meetings and adapt to your surroundings instead of expecting your surroundings to adapt to you. Check out There Goes the Neighborhood when it debuts tomorrow here.